The “cunning plan” is definitely showing signs of becoming a bit too successful. If I’m not too careful, I’ll be sooo relaxed in September, I might just forget to turn up on the start line! I started off the weekend with an overnight trip to Camber to visit a holidaying friend and my “have to leave in the morning” stretched to “around lunch time” and after a “do I have to go”, I eventually departed mid afternoon! Historically I wouldn’t have dreamed of being so far from home the day before a run, let alone spending the morning jumping around in the waves and then laughing at all those townies doing their King Canute impressions. For the uninformed, the tide at Camber goes out a very, very, very long way and watching people set up windbreaks close to the water’s edge at low tide can be very amusing! Anyway, I digress! The forecast for Sunday morning was cool and showery with sun expected late morning/lunch time. Well the forecasters were a few hours out! It rained ever so slightly before I left home but by the time we arrived at Stratford, the skies were blue and the heat tempered just a bit by a cool breeze. Having my brother and nephew there for support meant I didn’t have to worry about using the baggage area so while they went off to explore the park, I got my priorities right and joined the not too long toilet queue. Then I meandered around the assembly area taking photos and soaking up the atmosphere before thinking perhaps I’d better join that queue again – it was much longer by this time! Announcements to start gathering in starting pens seemed to go unheeded, well we didn’t have a lot of choice really if we wanted to be “comfortable” on our run! I eventually went to wait patiently in my “white wave” pen only to suddenly realise I was actually in the “pink wave” area, I blame it on my sunglasses and the pale nature of the pink! So having extricated myself from there and hastily finding the correct pen, I found myself at the bottom of the Orbit with a perfect view of the “warm up” man. Most of us joined in with the obligatory squats, arm waving and stretching. There was a short ten minute or so delay in the start but eventually Paula Radcliffe sent the first wave on their way and then it was time for my wave to move forward, ready for our turn. While waiting, I saw Paula walk past with an aide “so she’s not starting us all off then” I thought! No, we got Brendan Foster 😉 Only appropriate as the founder of Nova International which organises lots of mass participation sports events, including the Great Runs. I loved his final words of advice for us runners, “start off slow and then get slower”! Sensible words in view of the rising temperatures. 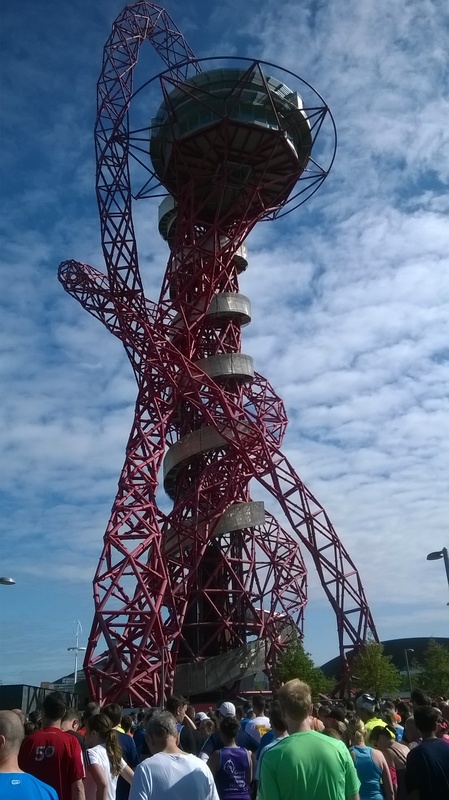 The route was out passed the Aquatics Centre, around the outer perimeter towards the Copper Box and Velodrome, before heading back towards the Stadium and running under the stands to emerge out on to the track for the final 300m. My memories of the course suggested to me that once we’d got over a hilly stretch at the start, the rest of the course would be fairly flat. Boy, did my memories get it wrong! Every time I thought “it’s going to be downhill after this one”, I’d get to the top and any enjoyment at the downhill bit was ruined by the sight of another slope up ahead. But I persevered and wherever possible kept to the shady parts of the route, it was getting hotter and hotter by the minute. There were musical interludes around the course to encourage us on our way. Audible groan moments? Not long after the start we were subjected to “Let It Go”, I’m assuming the joke was the fact it’s from the film “Frozen” and it was a hot July day! Then in the second half we had The Proclaimers with, yes, you’ve guessed it “I’m Gonna Be (500 miles)”. That’s enough to make anyone run faster! 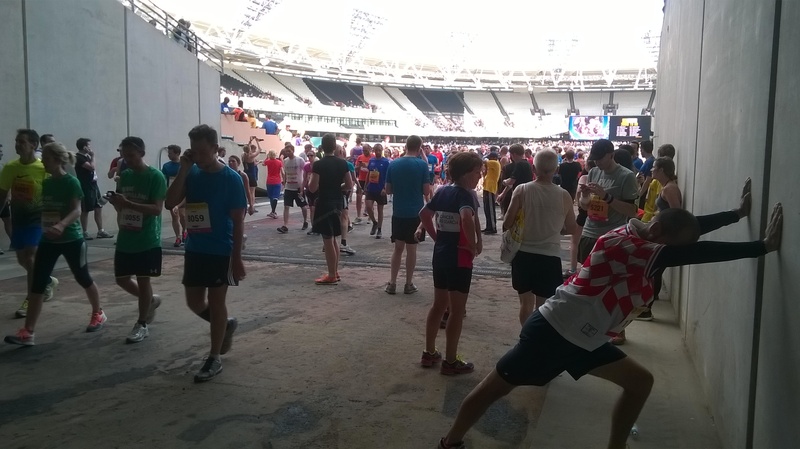 And then, perhaps predictably, as we ran under the stadium towards the finish we were greeted by the Chariots of Fire theme! During my other runs here, much of the park has been a building site which meant spectator access was limited and therefore support en route was severely lacking. Although there’s still a lot of building work going on, much more of the park is open to visitors so there was a bit more vocal encouragement on the way around. But the wall of sound when you emerge into the stadium is overwhelming. 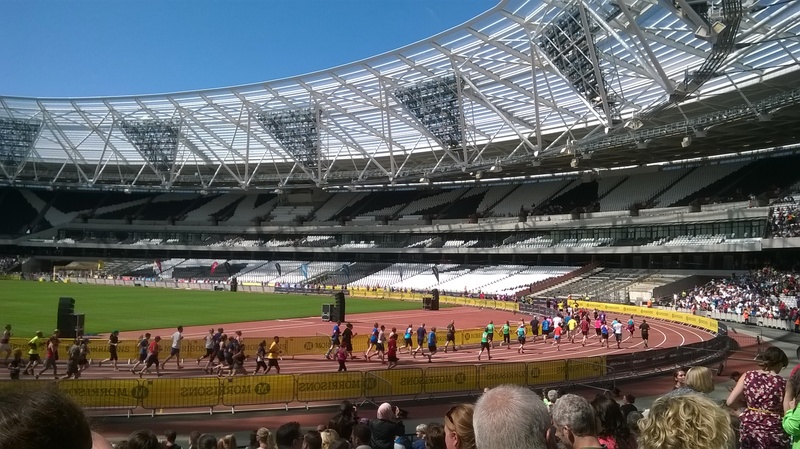 In a way it’s a bit of a shame that you can’t totally appreciate running on the track at the end of the run because you’re tired, hot and keen to finish – but I suppose it wouldn’t work at the start of the run, would it! Once we’d crossed the finish line we were ushered back out under the stadium where goody bags were being distributed and my first priority was to check that there was a medal in my bag after my experience in 2013 when a number of goody bags turned out to be medal-less and an uproar ensued. Then I think I probably walked around the whole of the outside of the stadium to get back to the turnstile I needed to rendezvous with my brother and nephew back inside the stadium! My overall experience of the run was such that I entered for next year as soon as I got home – entry was open before the run had even finished! I’m not sure whether the finish line will be on the stadium track again but it’s such a well organised event and it’s great to see how the park is developing. Oh, and I managed to run the whole 10k in a good time (for me)! 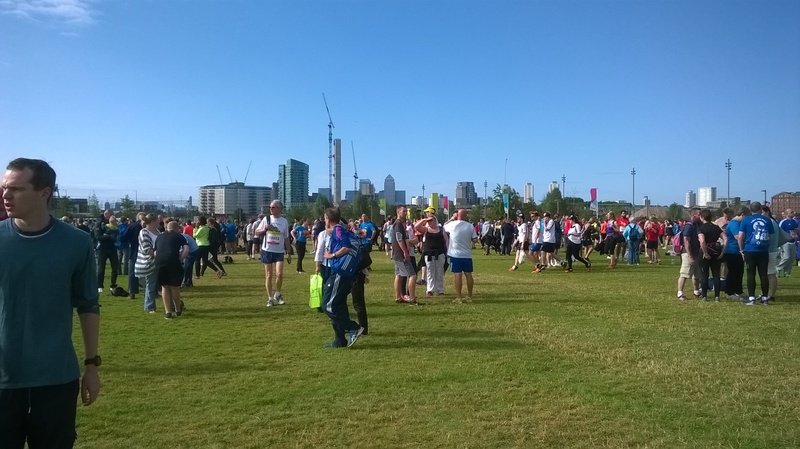 This entry was posted in running and tagged Brendan Foster, Foots Cray Meadows 10k, Great Run Series, Morrisons Great Newham London Run, National Lottery Anniversary Run, Paula Radcliffe, Queen Elizabeth Olympic Park. Well done – that sounds like a good event. I particularly liked Brendan Fosters advice. It very much suits my style of ‘running’!